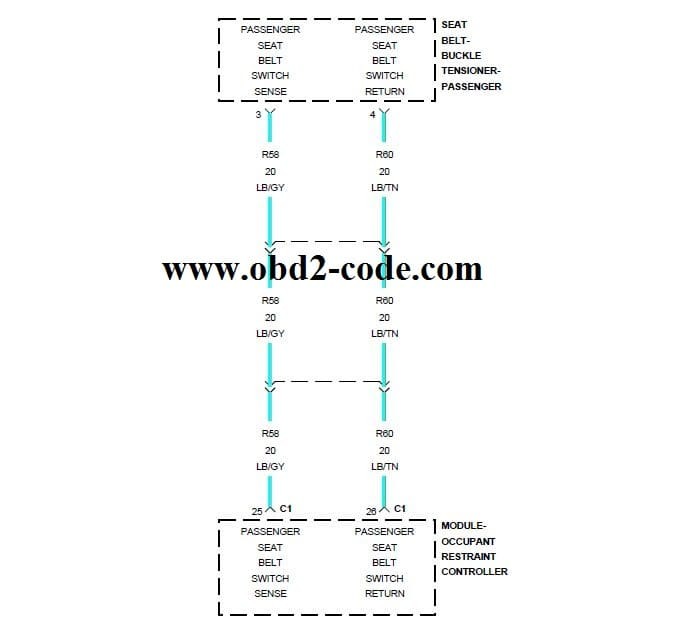 B1B56 code - When the powered, the Occupant Restraint Controller (ORC) sends a test current to the belt switches to verify the integrity of the switch and wiring. The use of the ORC connector adapter tool in the tests below provides a test point in place of the module. The ORC sets monitors the status of the seat belt switch circuits at power up and every 100ms thereafter while the ignition is in on. This DTC sets when the ORC detects the seat belt switch circuits have become shorted to voltage for more than 2.5 seconds. This DTC transitions from active to stored when the module sees a recovery from the shorted to voltage condition for greater than five seconds. Make sure the battery is fully charged. Turn the ignition on, with the scan tool read all ORC DTCs. Does the scan tool display active B1B56 1 ST ROW PASSANGER SEAT BELT SENSOR CIRCUIT HIGH? Turn the ignition off, disconnect the 12volt battery and wait two minutes before proceeding. Failure to follow these instructions may result in possible serious or fatal injury. Disconnect the passanger seat belt buckle tensioner harness connector continuing the seat belt switch circuits. Disconnect the ORC harness connector, check connectors clean and repair as necessary. Turn the ignition on, then reconnect the 12 volt battery and wait two minutes before proceeding. Failure to follow these instructions may result in possible serious or fatal injury. Measure the voltage of the passanger seat belt switch signal circuit between the appropriate terminal of the SRS load tool adapter. Is there any voltage present on the circuit? Yes, turn the ignition off, disconnect the 12 volt battery and wait two minutes before proceeding. Failure to follow these instructions may result in possible serious or fatal injury. Repair the passanger seat belt switch signal circuit for a short to voltage. Measure the voltage of the passanger seat belt switch ground circuit between the appropriate terminal of the SRS load tool adapter. Yes, Turn the ignition off, disconnect the 12volt battery and wait two minutes before proceeding. Repair or replace the passanger seat belt switch ground circuit for a short to voltage. Measure the reistance of the passanger seat belt switch signal circuit between the passanger seat belt buckle tensioner connector and the appropriate terminal of the SRS load tool adapter. Is the resistance below 1.0 Ohms? No, repair or replace the passanger seat belt switch signal circuit for an open or high resistance. Measure the resistance of the passanger seat belt switch ground circuit between the passanger seat belt buckle tensioner connector and the appropriate terminal of the SRS load tool adapter. No, repair or replace the passanger seat belt switch ground circuit for an open or high resistance. Turn the ignition off, disconnect the 12 volt battery and wait two minutes before proceeding. Replace the passanger seat belt switch. Reconnect the vehicle body harness to the switch. Turn the ignition on, then reconnect the 12 volt battery and wait two minutes before proceeding. Connect the scan tool to the data link connector - use the most current software available. Use the scan tool and erase all codes in the ORC. Turn the ignition off, and wait 15 seconds before turning the ignition on, wait one minute, and read active codes. Did the active B1B56 1 ST ROW PASSANGER SEAT BELT SENSOR CIRCUIT OPEN DTC return? Yes, If the Occupant Restraint Controller (ORC) is dropped at any time, it must be replaces. Failure to take the proper precautions can result in accidental airbag deployment. Turn the ignition off, disconnect the 12 volt battery and wait two minutes before proceeding. Replace the ORC Module perform the Airbag system verification. 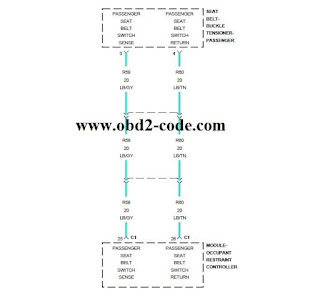 0 Response to "B1B56 1ST Row Passanger Seat Belt Sensor Circuit High"